Another fight, another 1st Round armbar submission victory for Strikeforce bantamweight queen Ronda Rousey (Pictured). Everyone knew what the “Rowdy” one’s bread and butter move was, yet just 54 ticks into Saturday’s scrap against Sarah Kaufman, the division’s former champion, Kaufman was crying uncle from the same maneuver that Rousey forced her other five victims to tap out to. Rousey was a 7-to-1 odds-on favorite to dispose of Kaufman, so the outcome of Saturday’s contest wasn’t what interested most fans. It was whether Kaufman could force Rousey into uncharted territory, the 2ndRound. 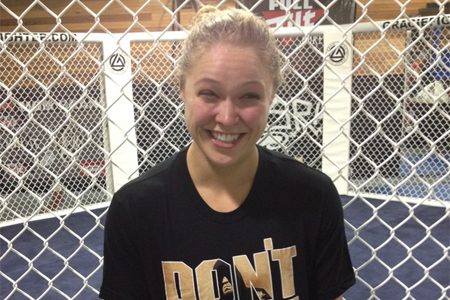 Also, Rousey promised to address Cristiane “Cyborg” Santos after tonight’s scrap. “I need to send out a challenge to Ms. Cyborg out there,” Rousey said. “People want to see the first fair fight of your life. I’m the champ now. The champ doesn’t go to you, you go to the champ. Come down to 135 [pounds] and let’s settle this. Cyborg is currently serving a year-long ban after testing positive for stanozolol metabolites following her dominant victory over Hiroko Yamanaka. UFC president Dana White immediately stripped the 26-year-old of her featherweight hardware. She is eligible to reapply for licensing as early as December 17th. However, tonight isn’t about a potential blockbuster bout between the ladies. Especially since it will be a tough task for Cyborg to hit the 135-pound mark on the scale. This is all bout Rousey. How big is the new face of women’s mixed martial arts? Forget about the ESPN the Magazine cover she donned, or her two-part “All Access: Ronda Rousey” documentary on Showtime, UFC president Dana White flew into town to sit front and center to watch Rousey do her thing.